Millions of people throughout the world now have a better quality of life because of dental implants. Dental implants are the only tooth replacement option that preserves bone and does not compromise the health of adjacent teeth – and they can potentially last a lifetime. Implants are today’s most preferred choice for restoring your natural smile with replacements that look, feel and function like natural teeth. Implants actually stabilize bone and prevent the inevitable bone loss that occurs when teeth are lost. Commercially pure titanium, of which almost all current implant surfaces are made, has the unique property of being “osteophilic” (osseo-bone, philic – loving), thus joining biochemically to bone. Osseo-integration (osseo – bone, integrate – to join or fuse with) was discovered quite by chance and has revolutionized dentistry. The fusion is almost like a pillar in concrete, allowing no movement at all. Stresses of biting forces are transmitted directly through implants to the bone – which they allow for very well. They provide virtually the same function as natural teeth roots, including stimulating the bone, thereby stabilizing it and preventing its loss. The concept and design of implants has been very well researched and tested. Implant tooth replacement systems often comprise separate and interconnecting units, which can allow the crown components to be removed and replaced if the need arises. Once an implant is placed in the bone time must be allowed for the osseo-integration (bone fusion) process to take place, usually between two to four months. One of the primary reasons for early implant failure is “loading” them with biting forces too early. Only in carefully controlled circumstances where stability of the implant(s) can be assured, is it possible to place implant crowns early, with any degree of predictable success. The “Teeth In A Day” concept is somewhat misleading, because the crowns placed on the implants are functional, but most often temporary in nature. This is more commonly effective in the lower front jaw where the bone is denser and implants can be splinted (joined) to crowns atop the implants assuring their initial stability. It is a little less predictable in the upper jaw and for single tooth replacement, but still possible in the right hands and circumstances. Is there enough bone and is it in the right place to allow tooth replacement with an implant? Implant placement and positioning is dependant upon adequate bone volume and density, which are therefore critical to success. In experienced hands, implants are extremely successful. Documented research and clinical studies indicate success rates of over 95% – which is higher than any other tooth replacement option. Even in areas of low bone density success is quite common. Once integrated and functional, implant restorations can last a lifetime. Dental implant is the restoration option that looks, feels and functions like a natural tooth. Other alternatives such as dental bridge and dentures could not do that and they may lead to bone deterioration later on. Dental implant is extremely durable and can last a lifetime. On average, a tooth-supported dental bridges can last from seven to ten years. After that they may need to be replaced. On the other hand, dental implants can last a lifetime if it is properly placed by an experienced implantologist and cared properly. It only requires periodic adjustments but do not require replacement. Dental implant does not harm any other tooth. 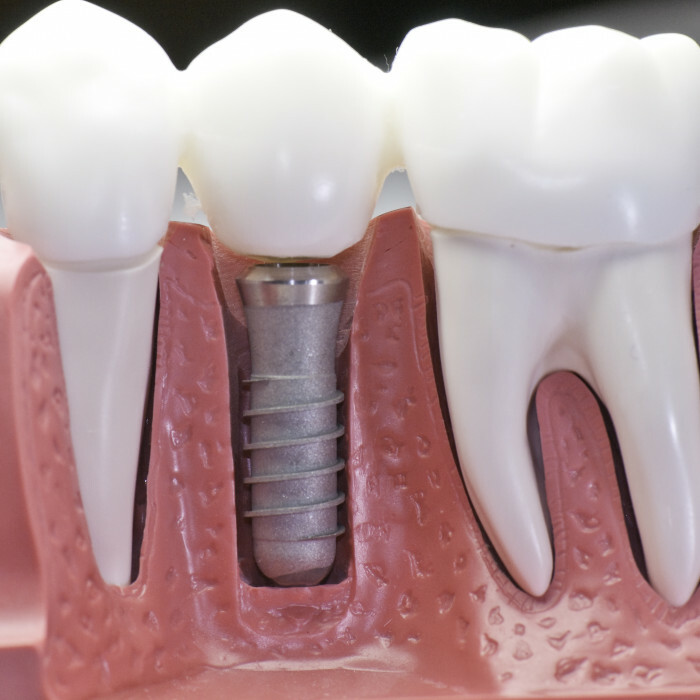 Unlike a dental bridge where adjacent teeth will be drilled down to make necessary room for it, dental implant works by replacing the root of the missing tooth. Avoid bone deterioration. Dental implant is surgically placed inside the jawbone. Hence, it could keep the jawbone intact, integrated and healthy. On the contrary, dental bridge and denture constantly deteriorate the bone and roots of the adjoining teeth. It is simple to keep a good oral hygiene. Dental implant restoration like crowns, bridges could be cleaned, brushed just like natural teeth. Dental implant also eliminates the inconvenience of removing dentures to clean at night or after meal. Improve your ability to speak. Poorly-fitted denture can slip within the mouth while talking or eating. Dental implants let you speak confidently and without worrying about that. How is dental implant done? A CB CT (3D) scan is required for our specialist to evaluate the bone quality, then determine the most suitable method. With conventional method, the tooth is extracted first, followed by sinus augmentation and/or bone grafting if there is insufficient bone to support an implant in the future. After that, the extraction site will be left to heal for about 1 to 3 months before proceeding to the implant surgery. This method is strongly recommended for any tooth that has big periapical infection/abscess surrounding the root or patient that has bad periodontal condition. With this method, extraction of the tooth and placement of a implant will be done during the same appointment. After extraction, a small amount of bone might need to be grafted at the extraction site. Immediate implant placement is typically recommended for patient who has moderately good jawbone with no or little/local infection at the roots. Depending on your jawbone, the placement of prosthesis (crowns, bridges) could also be done immediately or delayed. After the implant placement, a waiting period of 3 – 4 months (when bone grafting was not required), or 5 – 6 months (when severe bone grafting was required) is essential for the implant to integrate with your jawbone strongly and form a strong foundation to support the prosthesis. The implant is exposed and a healing cap will be screwed onto the exposed portion of the dental implant. After that, your specialist will then trim and shape the two flaps of gum tissue and reposition them back over the patient’s jawbone and around the implant’s healing cap. In 5 – 10 days, your gum will completely heal, your specialist will remove the healing cap and place the implant abutment. After that, impressions is taken to fabricate the crowns/bridges. In 3 – 4 days when your crowns/bridges are ready, implant abutments will be placed again and the crowns/bridges are cemented/screwed to the abutments. After the surgery, your specialist will screw the abutment(s) in and take impressions. This impression will be sent to a special dental lab to fabricate your prosthesis: crowns or bridges. After a few days these crowns/bridges will be fitted on the implants. This option is quite rare as it requires very good jawbone to hold the implant strongly to support the prosthesis. Additionally, it is typically used for single tooth implant only (except All on 4 dental implants). Over 50 years of development, dental implants nowadays have the highest success rate among restoration options for missing teeth. Clinical researches and studies show that the success rate of dental implants ranges from 93% to 97% depending on several factors such as jawbone condition, periodontal condition and patient’s medical history. Cost for the surgery: placement of the implants, bone grafting, sinus lifting. This depends on several factors such as: implant system, specialist’s skills and experiences, jawbone’s condition, amount of bone needs to be grafted. Cost for placement of the implant healing cap, implant abutment. This also depends on the implant system. Cost for placement of the final prosthesis: crowns or bridges on implants. This depends on the quality of the crowns/bridges, skills experiences of the prosthodontist. Can you tell me more about “teeth in a day” advertisements? Some implant centers advertise “teeth in a day,” implying that anyone can get their replacement teeth in one day, or even in just an hour. Unfortunately, relatively few patients are candidates and the advertising creates false expectations for the typical dental implant patient. The fact is that even the patients who qualify for this procedure do not actually receive their replacement teeth in one day. There is preliminary diagnostic work that is necessary prior to the “day” that they have treatment. And it’s a very long day, for those that do qualify. How can I tell if I am healthy enough to have dental implants? Generally speaking, if a person is well enough to undergo the treatment necessary for fixed bridgework or routine tooth extractions, the same person can undergo dental implant procedures. Also, patients may have general health conditions that would contraindicate implant procedures, although this is unusual. The best form of implant for you is determined after a thorough examination and discussion with your dentist and periodontist or oral surgeon. The amount and location of available bone is usually the major determinant as to which implant system is to be used, or whether you are a good implant candidate. Where dental implants are concerned, are there risks of the body rejecting them? When people hear the word “rejection” in connection with implants, they are usually describing conditions that can occur where there has been surgery that involves transplanting a vital organ such as a heart. However, dental implants fall into an entirely different category due to the fact that tissue matching, blood typing, etc., is not a factor as in the other procedures mentioned. The body completely accepts placement of dental implant material (like orthopedic materials which are similar) within bone; therefore, today’s dental implants meet with great success. Obviously, there are some dental implants that have not been successful. However, success has more to do with proper patient selection, proficiency of the practitioner, and the patient’s commitment to proper hygiene and preventive maintenance. Another factor in success involves regular follow-up care, just like other dental treatment. Both soft tissue health and the way the replacement teeth function and bite together must be evaluated periodically to ensure long term success of the dental implant. Dental implant should last a lifetime. However, we all can sight examples where teeth have not served for a person’s lifetime. We know that dental problems mostly stem from improper home care or lack of treatment when needed. The same holds true for implants. With proper care and routine dental check-ups they should last a lifetime. No one can give guarantees because the health of a person is dependent upon many factors which are out of the control of one’s dentist, e.g., proper nutritional needs being met, proper hygiene, genetics, disease processes which might occur. So, the answer to this question really is that no one knows how long each individual implant will last… one’s success can be influenced by the way you live and the quality of practitioner that you have chosen to do your implants… these things can tip the scales in your favor. Is the placement of implants painful? How long does it take? Implant placement usually does not result in much post-operative discomfort – usually the patient takes Tylenol or Advil for about 2-5 days. If more extensive treatment is needed, for example bone grafts or many implants, then the post-operative course may require more time and medication. Anesthesia during the surgery should make the placement procedure pain-free. We are conservative with anesthetic agents and our philosophy is to utilize the least amount of medication for the patient to comfortably tolerate the procedures. Depending on the complexity and number of implants being placed, the procedure can take between 30 minutes to 3-4 hours. Can any dentist give me an implant? Legally yes, but like any medical or dental procedure, not all practitioners have equal experience, training or comfort with implant treatment. Also, for every procedure, there is a “learning curve” and you want practitioners with significant experience to help you with implant treatment so you are likely to get the best possible long term result. I've heard that dental implants are experimental - is that true? Absolutely not! Dental implants have a long history of over 50 years of clinical use and success. Implants are the most thoroughly researched procedure in the history of dentistry and, while no procedure is 100% successful, the current technology has resulted in very high success rates in the hands of well-trained and experienced clinicians. Dental implants are carefully regulated by the FDA and a number of implant systems have been approved by the American Dental Association.